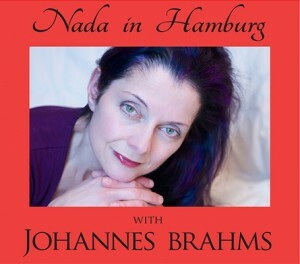 New York, NY: MEII Enterprises is proud to announce the forthcoming release of “Nada in Hamburg with Johannes Brahms” featuring Nada Loutfi, piano soloist, radio broadcaster, and educator. The 10-track album consists of prolific German composer Johannes Brahms’ (1833-1897) earliest works. May 7, 2016 is Brahms’ 183rd Birthday celebration. are chorales for piano. These pieces, transcribed by Nada for this album, represent the first recording of these chorales for piano. “Nada in Hamburg” is the pianist’s third album, the second with this artist for the MEII Enterprises label. Her first CD, the self-titled “Nada Loutfi Pianist” (1997), features the rarely performed sonata by Paul Dukas and the Fantasy pieces Op. 116 by Johannes Brahms. Executive producer for “Nada in Hamburg” is Joelle Shefts, Producer is Eugene Marlow. The 64-minute album was recorded on a 9’ Yamaha at TNT Studios (Louisville, KY), edited at Valhalla Studio (New York City), and mastered at Onomatopoeia (New York City). Pianist Nada Loutfi, a U.S. citizen of Lebanese/Hungarian descent, with a Paris Conservatory education, enjoys a career as a soloist, radio broadcaster and educator. She was a first prize winner at the Paris Conservatory who then came to North America for advanced studies at the Banff Center for the Arts in Canada and Indiana University in the U.S. with the late pianist Gyorgy Sebok. Her last recital tour took her to Tokyo and Nagoya, Japan. In New York City, she has performed Lebanese composer Elias Rahbani’s works and recorded pieces by classical/jazz composer Eugene Marlow. Nada has notably performed piano concertos of Bach, Mozart, Beethoven, Brahms, Chopin, Grieg, Rachmaninoff, and Ravel. Nada organizes, hosts, and performs in her own concert series “The Classical Hour” in Louisville, KY, where she has nurtured a large following of listeners over many years. “The Classical Hour” is a once-a-mouth live broadcast and a weekly pre-recorded program every Sunday at 4 p.m. local time which can be heard worldwide over the Internet. It is available as a free download at http://www.crescenthillradio.com/the-classical-hour-nada.html. Brazilian, and classical music. Its catalogue of 18 albums can be found at www.cdbaby.com/artist/eugenemarlow. The company also produces and distributes documentary DVDs, including “Shakerism: The First Two Hundred Years” (re-released in 2010) and “Zikkaron/Kristallnacht: A Family Story” (2015). Currently, the company is editing “From Decadent Dance Hall Music to Individual Freedom of Expression: Jazz in China” for release in 2017.